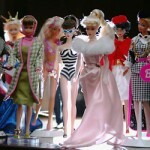 The Toyark › Girls Toy News › Barbie Turns 50 and Takes Over New York’s Fashion Week! Barbie Turns 50 and Takes Over New York’s Fashion Week! 2009 marks Barbie’s 50th Anniversary. Mattel is celebrating the occasion by releasing repros of Barbie Dolls throughout the past 5 decades, including the original Teenage Fashion Model Barbie from 1959. But more exciting yet, Mattel has signed a 3 year partnership with the CFDA which includes sponsorship of New York Fashion Week, which takes place February 13 – 20, 2009. Mattel will commission 50 top designers to put on a life-sized Barbie fashion show. What better way could there be to celebrate the 50th Anniversary of a fashion icon? Maybe Barbie will show up at the show in her pink porche…. Barbie is celebrating her 50th Anniversary and Mattel is partnering with CFDA which includes sponsorship of New York Fashion Week! What does this mean? A life-sized Barbie Fashion Show including clothing by 50 top designers! Come on, no one else is excited about this??? There must not be many girls on this site, although that doesn't surprise me. I need to start recruiting some more girls! i think itll turn out pretty cool. i hope they pay some homage to the old outfits like the black and white bathing suit. I think it's going to be pretty good too. I wish I could be there in person to see it!